Alzheimer’s breakthrough – and an Old Boy is heading it up! When Melbourne was selected as the first city in the world to trial experimental Alzheimer’s drug Anavex a year ago, lead researcher Associate Professor Steve MacFarlane (OB 1985) had no idea how much of an impact it would make. As reported widely in the media this week, preliminary results have been staggering. “They [the patients] seem to be significantly improved in terms of what they can do. It is function that has improved, and in many cases, mood as well,” said Prof Steve MacFarlane. Steve, who has amassed a wealth of knowledge over 25 years and is highly regarded in his field, is the Assoc Professor of Aged Psychiatry at Monash University and Director Aged Psychiatry Service at Caulfield Hospital (Alfred Health). He has been a consultant psychiatrist since 2003, and has research interests that include subjects as diverse as Alzheimer’s Disease, frontal lobe disorders and senile squalor. To read the full story about this Alzheimer’s disease breakthrough, click here. 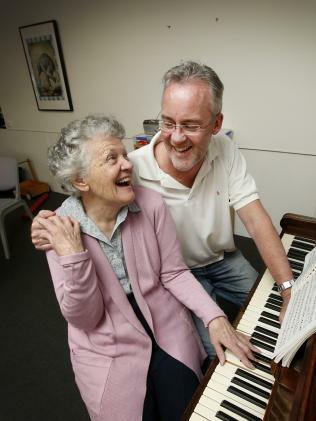 Image: Pauline Stevens, 78, pictured here with Assoc Prof Steve MacFarlane, has regained the ability to play the piano after taking a revolutionary new drug for Alzheimer’s. Picture: David Caird.